The idea for the CHOICE awards originated 15 years ago and was inspired by Japan’s Living National Treasures. That program honors “preservers of important intangible cultural properties.” In the years after World War II, anxiety arose in Japan that their unique cultural traditions — noh, kabuki, origami, kumi, sumo, teapot ceramics, noodle making etc. — might be swamped by the conquering Western culture. By honoring revered masters of these arts, they saved them and made them important to a new generation. Our original intention at CITYVIEW was to do something similar for Iowa’s venerable food pioneers. 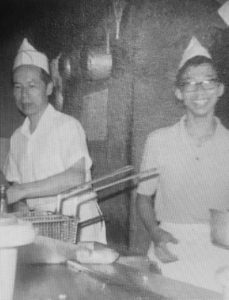 That evolved into a veritable hall of fame for people and food institutions that gave our city and state a singular quality and/or identity. CITYVIEW’s Hall of Iowa Culinary Excellence (CHOICE) awards began at a time when locals rued the passing of two of the most memorable food icons in Iowa history. The Younkers Tea Room was lost in a fire, and Dahl’s stores converted into Price Choppers. For the charter edition of the awards, we focused on venerability — enduring traditions and pioneers. The Japanese word “sabi” refers to a kind of beauty that is attained by aging, when an object’s elegance is evidenced by a changing patina. The word is most often applied to tea pots whose glaze has been changed by decades and even centuries of having tea intentionally poured over the top to drip down over the pot. In that spirit, our charter members in 2015 all had histories dating back to mid 20th century. Several topped more than a century of service to central Iowa. The following year’s class of honorable food pioneers was younger, but all blazed new trails that influenced the culinary scene of Des Moines in unique ways. Since then, we have expanded upon both categories of excellence. This year’s class is sure to remind you of both old and new food cravings. Dave Stark began working in the bakery business at age 14. His father and uncle had a bakery in Leon, Iowa, before they moved to Des Moines in 1948 and bought Barbara’s Bake Shop, then a premiere bakery on Ingersoll. They would pay off their mortgage in less than a year in large part because of a bread strike in Des Moines. Dave and his twin brother, Doug, would buy the place when their uncle retired, and they ran it until 1990. It soon became Des Moines’ largest retail bakery. From the early 1960s, the bakery would be best known for Barbara’s champagne cake, a recipe that the elder Starks purchased from Marge Carroll of Carroll’s Bakery in Spencer, Iowa. They tweaked it to produce their own unique product, and it quite soon caught on. By the early 1970s, the champagne cake was accounting for one-third to one-half of Barbara’s 300-400 cakes a day. Dave Stark says it’s also one of the most difficult cakes he makes. The delectable custard core is made in large batches with rum and sherry featured, but no champagne. 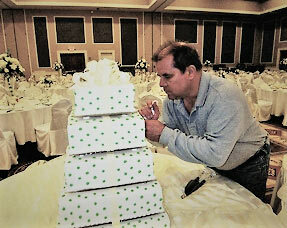 Stark returned to the role of bakery owner in 2003 after six years of running the bakery at Principal Financial and some other experiments in the restaurant business. He opened The Bake Shoppe in Windsor Heights with the intention of reviving the old methods of baking that he grew up on — scratch cooking, slow baking and the best possible ingredients. The champagne cake is once again his most popular. He will sell it in cups and Easter eggs, as well as all traditional forms of cake. 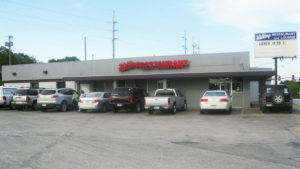 Bianchi’s Hilltop Restaurant has dominated its commanding heights on Hubbell Avenue since 1950, always family-owned-and-operated. That makes it at least the third-longest operating restaurant in Des Moines (behind Mr. V’s and Noah’s) and the longest continuously operating café in the same location. The restaurant is rife with tradition and neighborhood camaraderie. Daily specials are a big deal here, and many are the kinds of dishes that were more popular in 1950 than they are today — hot beef sandwiches, chicken and noodles, beef and noodles, etc. Such things are made with egg noodles and scratch gravy, too. A large mural of an Italian vineyard and a horseshoe-shaped bar are other special touches that have been disappearing from the American scene. Pizza here is a thin crust version that many east siders consider the best in town. Old favorites like frog legs, chicken livers and walleye pike still feature on the menu. Orders are generous to the extreme. It’s barely possible to consume the smallest of three sizes of thin-sliced onion ring orders. A side of hashed brown potatoes means two large patties. If Hilltop has a piece de resistance, it would be its homemade Barbara’s cheesecake, the only dessert on the menu. Mama Lacona’s is the second-oldest existing restaurant in the Teresa Tursi Lacona family that has produced Noah’s, Gusto, Aposto at La Scala, Bambino’s, Tursi’s Latin King, and Scornovacca’s. It was founded by Chuck Lacona, son of Teresa and brother of Noah. The name has long been rumored as a snipe at Noah in the “mama liked her recipes better at my place” vein. Unlike Noah’s and The Latin King, which have remained in one place for more than half a century, Mama Lacona’s has been a vagabond, moving with the city’s population from Beaverdale, to S.W. Ninth, to 22nd in West Des Moines, and 86th in Clive before settling in its gorgeous current digs on 121st Street in Urbandale. In its early days, it was also famous for home delivery of pizza and fried chicken in three-wheeled Cushman vehicles. While the venues have changed drastically, the menu has remained constant. That means Calabrese-American red sauce that simmers at least six hours, cavatelli that is made in house, potato focaccia, thin-crust pizza pies, and scratch-made yeast rolls that are addictive. The newest place has some history of its own. It was built by Miller Ream, the Northern California bon vivant who began the Rusty Scupper chain. Ream intended it as an upscale prototype for a new chain celebrating the surf culture of California — Maverick Grill. It opened just before the real estate crash of 2008, and its Italian marble bar tops and other lavish fixtures became available to Lacona’s soon after then. Steak de Burgo is a Des Moines thing. 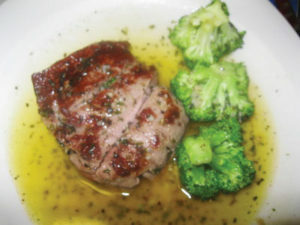 Filet of beef is cooked to order and served with a sauce that might differ considerably from one place to another. Almost every Des Moines restaurant that serves steak serves a de Burgo variant. A few others in Iowa do, too. It’s pretty much unheard of outside Iowa. It does resemble “Greek style” steak of Detroit and Mason City and steak with chimichurri in the southwest and in Argentina, but it is its own thing. Here we honor the oldest version that we have found in our 30-plus years of research. People argue whether it was invented by Johnny Compiano of Johnny & Kay’s or Vic Talerico of Vic’s Tally Ho. Both men grew up in the Francis Avenue neighborhood of north Des Moines. That area was far more ecumenical than the mostly Calabrese southside. European immigrants came from all parts of the old continent. The Spanish Civil War chased many to America. It also saw the traditional olive oil, garlic and herb sauce of Catalunya outlawed by General Franco, as Catalunya was the center of opposition to his dictatorship. Since Franco headquartered in Burgos, it has been theorized that clever Catalonians changed their aoili’s name rather than its recipe. Perhaps this spread to Francis Avenue and inspired Vic and Johnny to their great creation. Vic’s son is Jerry Talerico, who began the Sam & Gabe’s restaurants that carried forth his father’s recipe, with some butter added for olive oil. That restaurant now serves a recipe that includes cream, which is another kind of de Burgo popular in Des Moines. Jerry was one of the first-ever Iowa graduates of the Culinary Institute of America in New York and has been a trailblazer here for 50 years. 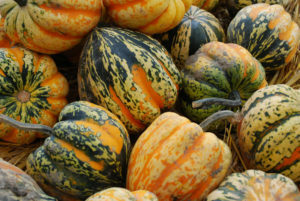 all winter squashes other than the field pumpkin. It’s certainly the most popular in the kitchen, often replacing pumpkin in pie recipes. native of Van Danem, Iowa. Long before GMOs, DuPont Pioneer-Hibred and Roundup’s control of the nation’s agricultural fields, a journalist named Henry Wallace, with the help of some friends from Des Moines, would launch Pioneer Hi-bred, the world’s first company aimed at using cross pollination to improve the characteristics of grains. The resulting better yields, greater uniformity, improved color and disease resistance changed the world and allowed Iowa farmers to feed exponentially more hungry people. It happened in Johnston, Iowa, and in scores of research stations around the world. 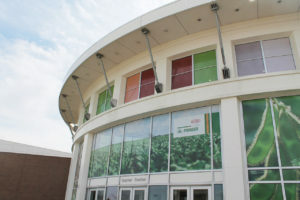 Lately we have been told that Pioneer will cease to be part of the company name after the merged Dow DuPont chemical company rechristens that part of their business as Corteva Agriscience. We wanted to be sure to get Mr. Wallace’s brainstorm into our hall of fame before it dies. Since 1930, the BH&G New Cookbook has been updating America’s rolodex of basic recipes. After selling more than 40 million copies through 16 editions, it has been the country’s go-to reference for the right way to make things our families care about. 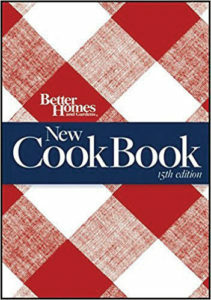 The last new edition included 1,000 all-new recipes. Food historians study old editions to get a bead on how America has grown and changed over four generations of kitchen tutelage. The distinctive checkerboard design has made the book the most identifiable on the cookbook shelf. The indexed binder style has made it easy to add family recipes over the decades. It’s an American classic. I am so happy to see these wonderful family restaurants honored in this manner. We have enjoyed many, many meals and events at each of them. We miss Kwong Tung so much. Nothing else compares. Thank you harolding these iconic emblems of Des Moines history and great memories!